Thakur Chedi Lal, who was then the President of Mahakoshal Regional Congress Committee, put forth proposal during the Haripur Session for the next session to be held at Jabalpur. 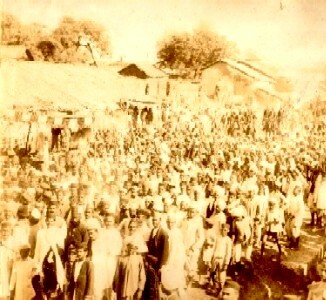 The All India Congress Committee accepted the invitation to hold its 52nd Congress Session at Jabalpur in the year 1939. Since thrice the session has taken place in the Madhya Pradesh, but it was for the first time it was going to be organised in Mahakoshal region. 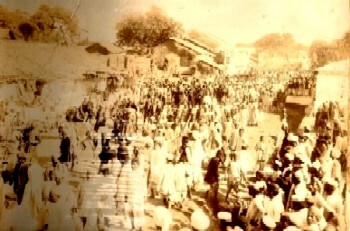 Previously, it took place at Nagpur in 1891, at Amravati in 1897 and again at Nagpur in 1920. It was called Tripuri Congress in memory of the ancient city of Tripuri and also the capital of the Kalchuri dynasty. Huge arrangements were made to have the session at Tilwaraghat, on the bank of river Narmada. Since Govind Das ji was in the welcome committee, so he was entrusted upon a lot of responsibilities for the session. Prior to the session, he carried out a tour and collected funds for the session. A new township was erected with all modern facilities like telephone, telegraph, bank and hospital. All arrangements were made for the session, the camp area was named after first Congress leader from Mahakoshal- Pt Vishnudutt Shukla as ‘Vishnudutt Nagar’. The session become a historic one as it saw the tussle between Gandhiji and Subhash Chandra Bose. It was during this session, Subhash Chandra Bose was elected as President of All India Congress party. Gandhiji described Pattavi Sitaramiya’s defeat as his defeat. 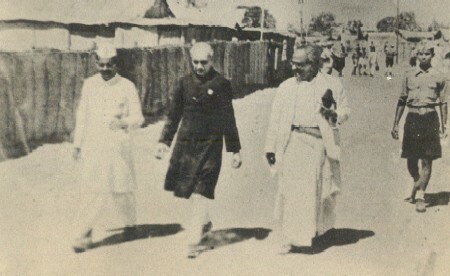 Subhash Chandra Bose came to participate in the session with severe illness. He was elected President during the session but could not preside over the session as result of his illness. Some senior members even described this as an act by Subhash ji. All praised the arrangements made by the committee. During the session, Seth Govind Das made speech as President of the Welcome Committee. He also commented upon the election of Subhash Chandra Bose and the tussle, witnessed by everyone, by saying that as clouds of Second World War are hovering over our heads, we should be united rather then pointing finger over our leaders and doubting their decision. People from every nook and corner of the state had come in large numbers to be part of session and witness the grand rally comprising of 52 elephants. But the newly elected President could not be part of the celebration procession due to his illness. In order to set foot into the share market, he first made purchase of flat at Lake area and office at Clive street. He focussed his attention upon his business and his writing. It was here, he wrote three plays- ‘Tyag Ya Grahan’, ‘Hinsa se Ahinsa’, ‘Prem Ya Pap’ and ‘Atma-hatya ya Atma-Balidan’. Gulab Prasna ‘Shakal’ and Bhagvati Charan Verma were working on the film. It was through them, Govind Das ji was introduced to literary circle of the city. It was on the insistence of his well wishers, Govind Das ji decided to stage his play ‘Hinsa se Ahinsa’. His friends suggested that since Gurudev Rabindranath Tagore was also in Calcutta the play should be inaugurated by him. So Govind Das ji went to Gurudev and since it was their first face to face meeting, a secretary introduced them. But on seeing Govinddas, Gurudev remarked that who does not know the name of Govind Das ji. Then he expressed his desire before Gurudev. After pondering, Gurudev said that he wants to listen to the play before actually inaugurating. For 4 long days, he listened word by word. On the last day, he got up from his armchair and caught Govind Das ji’s hand and said, ‘though we belong to different schools, I’m a poet while you are a critic, but your play could be compared to any good work of your school.” He then gave his consent to inaugurate the play. Govinddasji and Gandhiji remained in touch and had a family relation even if they had intellectual differences on some points. Though he had withdrawn from active politics but on initiation of any new movement, he had decided to come forward and render his support. On coming to Jabalpur, he was again put behind bars. It was here, he wrote notes for his play named ‘Karna’ which he completed during his jail period in 1942. This play is based on the character ‘Karna’ from mythological epic Mahabharat and depicts both his good as well as bad qualities. Besides this, he also wrote one act plays ‘Santosh Kaha’ & Garibi ya Amiri’ both problem based. But this time, he wrote one act plays with monologue. It was Robert Browning who had first used the technique and over the years, writers have incorporated the technique. Under this, the character addresses an abstract object or another person on telephone or even his dog. 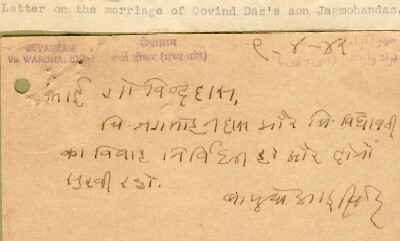 Govind das ji was the first to introduce the technique in Hindi literature. His play ‘Shaap aur Var’ is based on this technique of monologue. During this imprisonment for participation in satyagrah, he received the news of the death of Gurudev and Subhash Chandra Bose’s fleeing the country. He was released early on medical grounds and operated upon by Dr. Cherry at Victoria Hospital for ‘hydrocil’ and ‘hernia’.